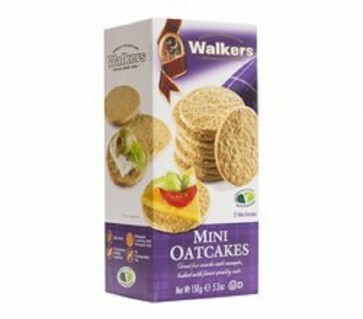 Tasty coarse textured Walkers oat crackers in mini form. Perfect for entertaining smothered in rich pates, delicate smoked salmon and smoked Arran cheeses. Contains 27 mini oatcakes. Ingredient: Oatmeal (65%), wheat flour, vegetable oils, sugar, sea salt, raising agent (sodium carbonate), skimmed milk powder. Contains milk, wheat, gluten. Not suitable for nut allergy sufferers.